This is what you think it is. Blood pasta. 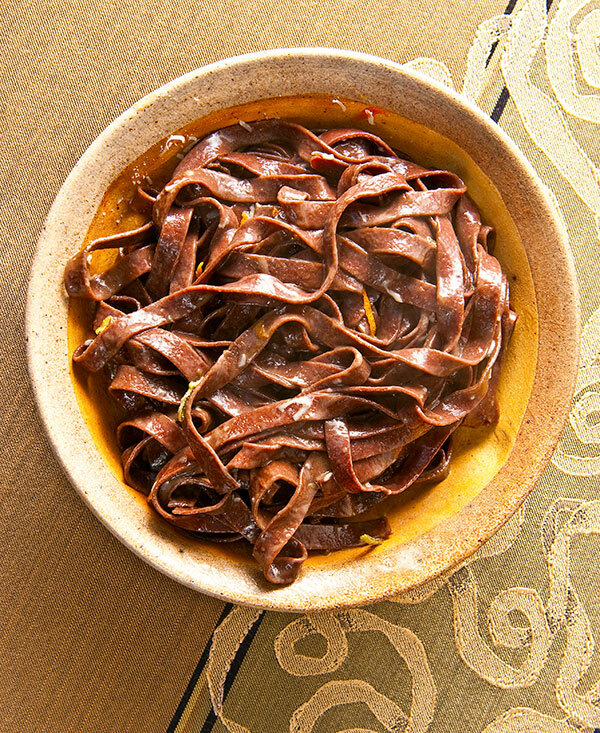 Pork blood pasta, to be exact. It’s something I’ve been wanting to make for more than a year. And let me tell you folks, as weird and as Andrew Zimmern-like as this dish is, it was totally worth the wait. This stuff rocks. Of course, that is to say this pasta rocks if you a) eat pork, b) like pasta, and c) aren’t irretrievably skeeved out by the concept of eating something made with blood. Vegetarians might want to skip this post. My infatuation with this pasta started with a book. Oretta Zanini de Vita’s Encyclopedia of Pasta, to be precise. I began working through some of the cooler pastas I’d read about. I made Sardinian saffron gnocchi and I made strettine, a pasta made with nettles in the flour. I made acorn pasta, a famine food of Puglia. But always I thought of blutnudeln, pasta al sangue. 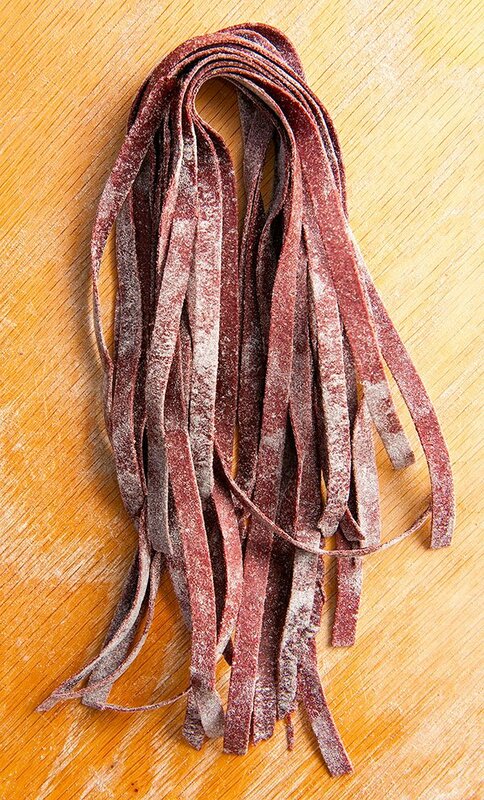 Blood tagliatelle. If there is a stranger pasta that is traditionally eaten in Italy, I can’t think of one. Blutnudeln is a specialty of Pusteria, in the Trentino-Alto Adige region of Alpine Italy along the Austrian border; thus the German name. Pasta al sangue was, historically, part of a family’s annual hog butchering ritual. It’s made with a combination of rye and wheat flours — rye being the dominant grain in this chilly area — an egg, and lots of fresh pork blood. It’s served with butter, sage and a local dry cheese. Simple. I got a chance to meet Mrs. Zanini de Vita at the James Beard awards in 2010; her book won Best Cookbook in the Reference and Scholarship category. I practically bum-rushed her table afterwards. As best as I could in my broken Italian, I gushed to her how much I loved her book. She smiled, and said in her broken English how happy she was to have her book read in America. I was over the moon. Finally I screwed up my courage and ordered some pork blood. It comes in gallon jugs, so I plan on making some blood sausage with it, too. For the dough, I used some Italian “oo” flour, some rye flour, an egg, a pinch of salt, and the pork blood. The raw dough was alarmingly pretty. It sure looks like a beet pasta dough. But it ain’t. 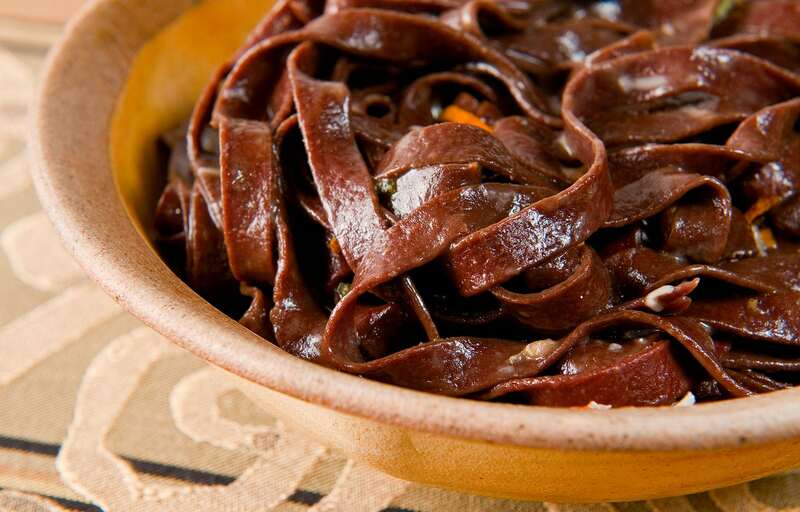 According to Zanini de Vita, blutnudeln are rolled out thin and cut into 3/8″ noodles, like tagliatelle. I rolled mine out to No. 6 on my Atlas (No. 9 is the thinnest setting) and ran it through my tagliatelle cutter. Pretty! Now for the sauce. Why not make a blood orange sauce? The sauce would be butter in which I’d fry some sage, reduce blood orange juice and top with blood orange zest, grated cheese and black pepper. Holly and I sat down to eat. I admit to a twinge before digging in. There is something about blood that’ll do that to you. Blood, more than anything else, symbolizes life. There’s a reason many of us hate to see the sight of it, why the vampire mythology touches something deep within us. For me, meat is animal turned into food. But blood is akin to the anima of the animal itself and occupies an entirely different mental space. Intellectually it doesn’t make any sense. But we humans are not ruled by intellect alone. I took a bite and was immediately aware of two things: That I’d nailed the texture of this pasta — it was perfectly al dente and perfectly shaped — and that I was tasting blood. Coppery, minerally, savory. The tang of the citrus brightened the dish, the sage added bitterness, the butter smooth sweetness. I liked it. This is not comfort food. 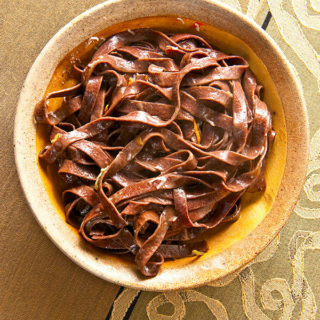 Yes, at its core this is still pasta, and the overwhelming sensation you get while eating this dish is definitely grain, but you feel the blood’s presence with every bite. As you eat it, you can’t help but think about what went into this pasta, and about that pig. And that’s as it should be. This is a noodle made on both sides of the Alps, although this is the Italian version. I’ve seen some Austrian versions of blood pasta where they’ve added finely minced fennel fronds to the pasta dough, which I think would be pretty cool. Use your own taste as a guide. You can get pork or beef blood from ethnic markets, especially Asian markets. A good butcher or local producer at your farmer’s market is even better. Do use the rye flour in this recipe, as it creates a more rustic flavor. The traditional sauce would be browned butter, sage and a grated cheese. I went with a more Mediterranean sauce, however. To make the pasta, whisk together the two flours and salt in a large bowl. Make a well in the center of the flour and crack the egg into it. Pour in the blood and stir everything together with a fork. When the dough is a shaggy mass, begin to knead it in the bowl. It will be sticky at first, but will smooth out as you knead, first in the bowl, and then on a floured work surface. Knead for 5 minutes. Wrap the dough in plastic wrap and set at room temperature for 2 hours, or in the fridge up to 1 day. Roll out the dough into 3/8-inch flat noodles that are not too thin. I use No. 6 on my Atlas (No. 9 is the thinnest). Set aside to dry. To make the sauce, reduce the orange juice by half, turn off the heat and add salt to taste. Set aside. Bring a large pot of salty water — the water should taste like the ocean — to a boil. When it boils, melt the butter in a large saute pan over medium-high heat and fry the sage. Add the pasta to the boiling water. By the time the pasta is floating, the sage will be nicely fried. Add the orange juice mixture to the butter and sage. Allow the pasta to cook 1-2 minutes after it begins to float, then transfer it to the pan with the sauce. Sprinkle some salt over everything and toss to combine. Serve at once with the orange zest and grated cheese. Realmente, acredito que não tenho coragem de comer, embora esteja com uma aparência agradável mas o fato de ter sangue de porco fresco tirou o meu apetite.